Website Design in St Albans - we create stunning websites for clients large and small. We specialis in WordPress, ecommerce, Magento, SEO. Talk to our highly skilled web designers about creating the stunning new website and ecommerce solution your business needs to create the right impression and increase sales! We specialise in ecommerce and develop ecommerce solutions that enable your customers to buy easily and effortlessly. Talk to us today about our flexible and scalable ecommerce solutions. Reach your customers wherever they are. We create dynamic, responsive websites to ensure that your customers can access your business on any device. 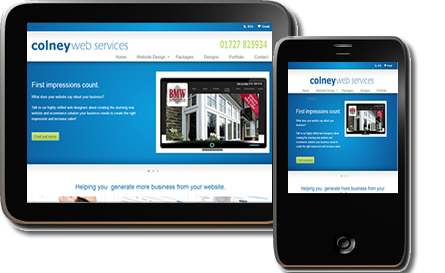 Ask us about responsive website design for tablets, iphones and smart phones. Helping you generate more business from your website. Let us translate your ideas into an amazing website creating a truly impressive online presence for your business. The higher your website ranks in the Search Engines, the more business you will attract and the more money you will make! Our expert ecommerce web designers can create an ecommerce solution to enable your customers to buy from you quickly and easily.